Sepakbola comes from the word ‘Sepak’ meaning to kick and ‘Bola’ which means ball. Our national team are often called Tim Garuda or Skuad Garuda meaning the Garuda team or squad. Garuda (the eagle) being our national emblem. 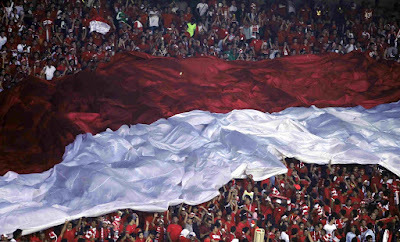 It is also often referred as Tim/Skuad Merah Putih, which is true to our national flag ‘Merah’ (red) and ‘Putih’ (white), and Timnas, an abbreviation from Tim Nasional meaning the national team.The Indonesian FA is PSSI (Persatuan Sepakbola Seluruh Indonesia). Pelatih: Coach (not necessarily a head coach). From the verb ‘Latih’ meaning to train. Our current senior national team coach is Aji Santoso, a former wingback for the national team. Direktur teknik: Technical director. (Note: We just had our previous senior NT coach, Wim Rijsbergen made the NT technical director. You would probably remember him as one of Rinus Michels’ players from the Netherlands 1974 squad). Lately, it’s becoming a trend to call the head coach and refer him as “Coach” followed by their first/last name/initials. For example: “Coach AS/Coach Aji akan melakukan pergantian pemain.” “The coach is about to make a substitution”. Hakim garis: Linesmen or referee's assistant. Pemain: Player. From the word "Main" meaning to play. Pemain sayap (or more often just Sayap): Wingers. From the word ‘Sayap’ literally meaning ‘wings’. Penyerang: Attacker/forward/striker. From the word ‘Serang’ meaning to attack. Pemain belakang: Defender. From the word ‘Belakang’ meaning (in) the back. (Note: nowadays, we call the defender ‘Bek’ from the word ‘back’. Pemain tengah: Midfielder. ‘Tengah’ means middle/in the middle. Gelandang: Is another term for midfielder. Penjaga gawang: Goalkeeper. ‘Jaga’ means to guard, while ‘Gawang’ means the post/bar. Kapten: Team Captain. Our NT captain currently is Bambang Pamungkas (FW) a legend in Indonesian football already, who plays for the most prominent team in the capital, Persija Jakarta. Wakil kapten: Vice-captain. Our current national captain is Firman Utina (MF) playing for Sriwijaya FC, a team from Palembang. Oper: To pass. Another word synonymous to this is Umpan, which literally means ‘Bait’. Operan panjang: A long pass/ball (or Umpan panjang). Operan pendek: A short pass/ball (or Umpan pendek). Operan teroboson: A through pass/ball (or Umpan terobosan). Kartu kuning: Yellow card. From the words ‘Kartu’ (card) and ‘Kuning’ (yellow). Kartu merah: Red card. From the words ‘Kartu’ and ‘Merah’ (merah). Diusir: Being ejected. From the word ‘Usir’ meaning to eject. Bunuh diri/gol bunuh diri: Own goal. The term ‘Bunuh diri’ actually means suicide. Cedera: An injury or to be injured. Tendangan bebas: Free kick. From the word ‘Bebas’ meaning free or to be free. Tembakan ke gawang: Shot on target. Pertahanan gerendel: A synonym to Italian’s Catenaccio. ‘Gerendel’ literally means ‘door bolt’. Pemain pengganti: A substitute player. Trisula: The trident: A three-man attack. Peluit panjang: The literal meaning is ‘the long whistle’. The term is usually said to signal the beginning and the end of a match. Stadion: Stadium. Our main and biggest stadion is the Gelora Bung Karno (Jakarta), named after our first president Soekarno (often called Bung Karno). Mulut gawang: In the/the goalmouth. Ruang ganti: The changing room. Tiang and Mistar: The post and crossbar of the goal (respectively). Kesempatan emas: Literally means ‘golden opportunity’. Imbang: A draw at the end of match, but can also mean an evenly game/match. Bonek: A group of die hard fans. An abbreviation of ‘Bondo Nekat’ which is East Javanese means reckless boy(s) or reckless man(men). Started as a group of fans of the club Persebaya Surabaya in East Java and is now almost synonymous with those die-hard fans everywhere. Especially in Java. Dilanggar/melanggar: To be fouled/to foul. Other terms are usually derived from the English word or term, ie. 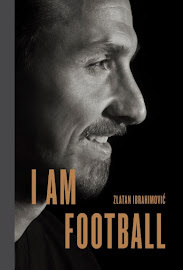 ‘Bek’ from the word ‘Back’, ‘Gol’ from ‘Goal’, ‘Top skorer’ from ‘Top scorer’, etc. Kuyakin hari ini pasti menang” ( We’re sure today will be victorious”). Aditya Regar lives in Jakarta, Indonesia. He supports Indonesian football and Juventus FC in Italy. You can follow Aditya @adityaregar on Twitter. Thank you for the excellent work on this article. Well it's far from excellent. Hopefully it will be useful to your readers.